Rosina is a highly qualified Reiki practitioner and teacher. She has been a certified Reiki Master in Usui and Tibetan Systems and teaching Reiki since 1996 and has been doing Reiki since 1992. She is a member of the Chartered Natural Therapies Practitioner of New Zealand. Reiki is an ancient, hands on healing therapy. It treats the cause of dis-ease within the body and mind, whether physical, emotional, mental or spiritual. It is simple and subtle, and yet very effective. It balances and calms. It brings about clarity and understanding. Reiki helps remind us of who we are beneath the stresses, worries and judgements or the modern world. It draws attention to the ways in which we are limiting ourselves and our experience of life. It has the ability to awaken our awareness. It can remind us of our potential. Reiki complements all other therapies. A Full Treatment of Reiki is physiologically equivalent to 3-4 hours of sleep. Reiki is awareness: awareness of body, awareness of mind, awareness of yourself, and your relationship with the world. Often the cause of a physical disease is to be found within, in our thoughts, our habits, the ways in which we condition ourselves to act in daily life. Thus, by becoming aware, we allow the possibility of change. That is true healing. Reiki is holistic by nature, treating more than just symptoms. It gives clarity. It stills the mind so that the important lifts free from the mundane. It helps the body reset its priorities. The cause of a dis-ease then draws attention to itself, and is treated. There may be short term discomfort but, if so, it is always symptomatic of the beneficial effects of Reiki. For example, temporary aches due to increased circulation in an arthritic joint where circulation has been poor for many years. Reiki merely gives us the energy and awareness to change. A treatment involves the placing of hands gently on the body. There is no manipulation of body tissue. Reiki works with the body on an energetic level, effecting change from there into the physical, emotional and spiritual realms. Reiki is administered through clothes. It is best to wear natural materials and no jewellery. During a treatment most people experience a tingling or warmth coming from the practitioner’s hands; others a cold or a numbness. The Reiki experience is a personal one. It is different for everyone. Reiki help to balance “chakras” within the animal body. A balance within the chakras results in optimal health and vitality. It is through the chakra network that the animals’ mind, body, and spirit interact as one holistic system. Damage to one of the chakras through trauma, injury, emotional conflict, or other means, manifests as dysfunction in the related area of the physical animal body. Thus, disease are caused. The purpose of using Reiki is to restore the balance of subtle energies and return the physical animal being to a healthy state. 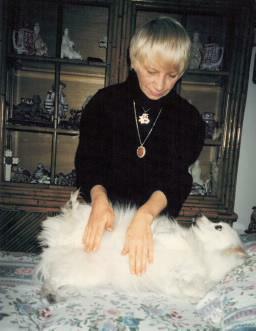 Special emphasis is being given to treating animals by using Reiki. From experience, pets are very receptive to this treatment, enjoying the sensation and extra attention. All treatments compliment orthodox veterinary medicine therapy. They do not replace visits to your veterinary surgeon for any cases. Reiki can be defined as Universal Life Force Energy. It is an enlightenment system and healing art. Reiki is very easy to learn and easy to use and anyone can do it. Reiki healing is a process of being connected to the Reiki Energy through an attunement. Healing is done either hands on or by distance work. Reiki work by simple laying of hands and intent. It helps bring us back into harmony with the Universal Life Energy and let it flow. (c) , 2002-2012 Animal Talk LTD.